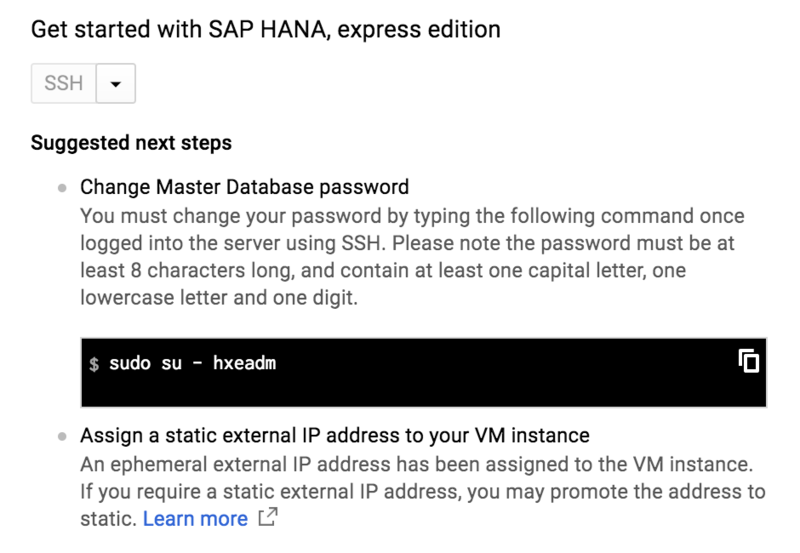 In this blog, I will discuss the initial setup steps for the SAP HANA, express edition VM on GCP and provide some background information and suggestions for a secure configuration of your HXE system. 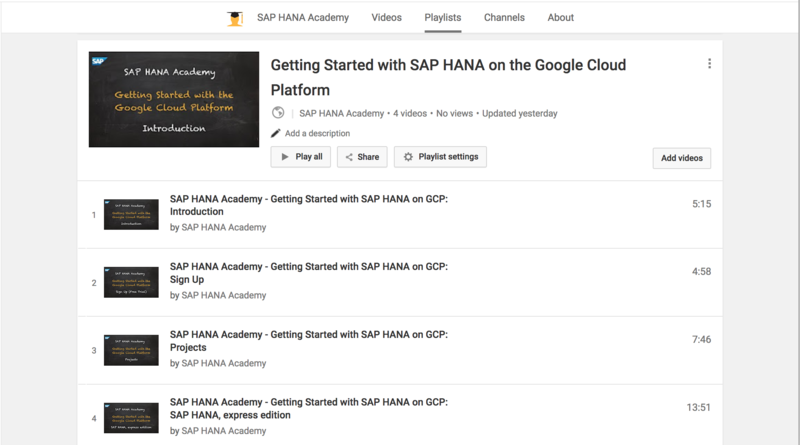 Once the SAP HANA, express edition VM has been created by the GCP Cloud Launcher, you are presented with a number of suggested next steps. Before you can get started using SAP HANA, express edition, you need to login first with the SAP HANA administration account: hxeadm. This is the software owner, the account that was used to install the software. For the SAP HANA, express edition VM (the one you can run on your computer), a temporary password is provided but for the cloud version on GCP the approach is different, and to be fair, a bit more secure. Spoiler alert! The HXEHana1 password is not valid on GCP. Message: password already used. On GCP, you will be asked to set the password of the hxeadm user yourself. Now you may wonder, how do we connect as hxeadm if we do not have a (temporary) password in the first place? For this, a standard practice is used in Linux system administration: run the command as the superuser root. So with the ‘sudo su – hxeadm‘ command, we want the su (substitute user) command to open a login shell with all the environment variables of the hxeadm user (note the dash in ‘su – hxeadm‘) and do this with the privileges of the superuser (sudo = superuser do). Without the sudo, su would still prompt us for the password of the hxeadm user. The password policies of SUSE Linux and SAP HANA, of course, come both from a different source and do not exactly match. Characters that are allowed on the OS, are not allowed in the database, so, how can we set the passwords for both the operating system administration account hxeadm and the database super user SYSTEM at one fell swoop? By using a script to map the default SAP HANA database password policy to SUSE Linux. Note that when you perform your own installation of an SAP HANA system (including express edition), the installer will prompt you to specify the passwords for both the operating system administration account and the database SYSTEM user separately. There is no single ‘database master’ password. For this reason, you will not find any reference to a ‘database master’ password in the SAP HANA platform documentation as the concept does not really exist. 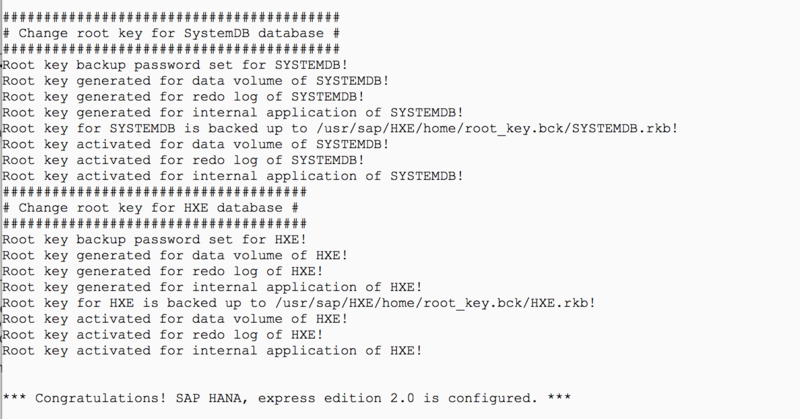 It is specific to the HANA express setup. If you decide to enter N at this point, nothing will have changed and the script will be launched again to prompt you to set the master password next time you connect. If you do decide to proceed, as recommended, the initialization script will check if the SAP HANA system is up and then continues to change the SYSTEM password for both the SystemDB and the HXE tenant database. 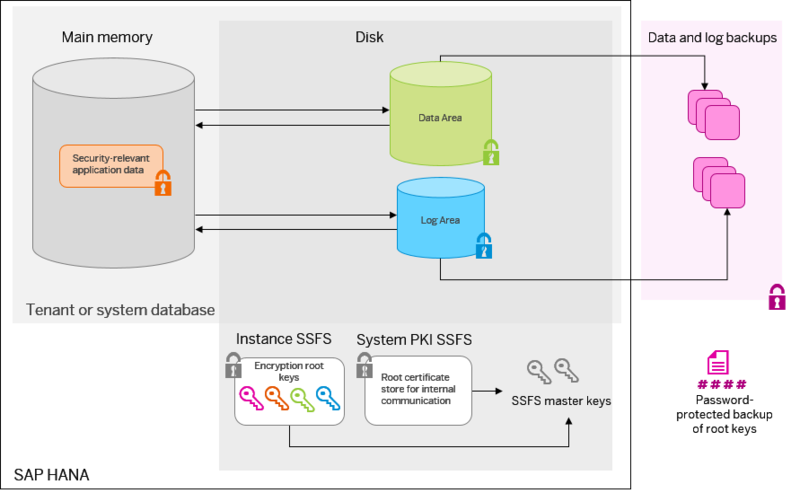 Next, the initialization script will update both the SSFS master keys and all three root keys in both the SystemDB and in the HXE database, and make a backup. This is a critically important step. 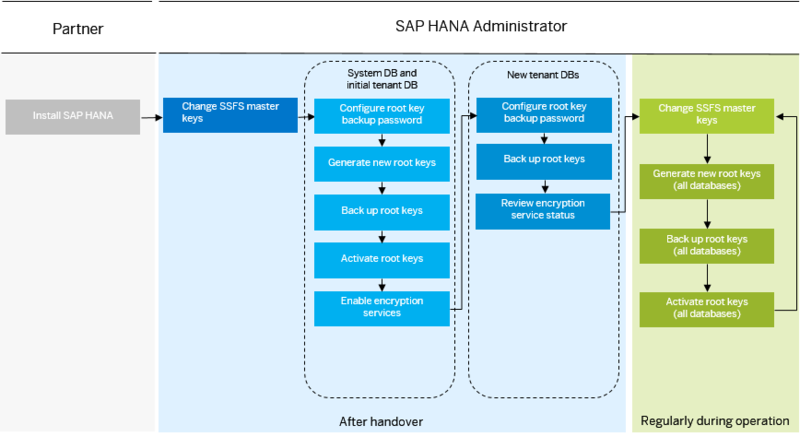 Unique SSFS master keys are generated when you install SAP HANA and unique encryption root keys are generated when you create a tenant database (for the system and default tenant this also happens during the installation). For a cloned system, like express as VM (cloud or local), all keys are the same. It’s a hacker’s paradise and a security administrator’s nightmare. So, this needs to fixed A-SAP. Immediately after system handover from your hardware or hosting partner, perform the following steps. Below the section from the script where the new master key is generated. Note that the rsecssfx utility is used for this. You can run the rsecssfx command as well (once the script is done) to query the key store with the ‘info‘ parameter. As there can be more than one store, you need to specify where it is located and one way to do this, as in the script, is by setting the RSEC_SSFS_DATAPATH environment variable. We have two secure stores, each protected by a master key, and then we also have, per database, four encryption root keys for data volume, redo log, application services (and backups, although this key is not configured by default for express edition). Although the root keys are on the file system, SQL statements are used to create and activate them. Below the section from the script where this done. Of course, for many reasons, you might not want to have a single password for both the operating system administration account hxeadm and the database super user SYSTEM. Now what? No problem, you can easily change the password of the hxeadm user, once the script has finished. This does not impact the proper functioning of SAP HANA in any way. For this, you can use the passwd command. This time, the default SUSE Linux password policy rules will apply and SUSE uses PAM (Pluggable Authentication Modules for Linux) for this. Configuring PAM is all command line, so not the most user-friendly part administration. The passwd command will complain if the password does not comply with the rules but will execute the task as requested anyway. As Linux superuser, you can do anything. Even destroy the whole machine. (bold, red – that’s a warning). To change the SAP HANA database passwords, we first need to discuss the SAP HANA interactive terminal tool, hdbsql, and SAP HANA password policy. This, we will do in the next blog. In this tutorial video below shows you exactly how the initial setup process takes places and, as a bonus, also how you can configure a static (fixed) external IP for you VM instance. I have launched SAP HANA, express edition (server + applications) to my project according to your instruction. However I cannot access services using external IP provided, ping is not working either. I have checked firewall and it seems to be configured correctly. Are there any other configurations I need to make? I understand that the firewall on the (HANA) server side has been configured to allow connections but that you cannot access the server from your client (in the office), for example, a URL in a browser (HTTP port 80) or a telnet connection (SSH port 22). It is possible that there is another firewall at your office. For example, here at SAP we have network for internal systems and one for external access (like Google cloud). With GCP you can access the VM using SSH in a browser window to circumvent any corporate firewall. Does this work for you? You were right about the firewall at my office. The problem is solved by switching network. Good to hear the issue is solved. Thanks for letting us know.